Salk Polio Vaccine Conquered Terrifying Disease On April 12, 1955, the world heard one of the most eagerly anticipated announcements in medical history: Dr. Jonas Salk's polio vaccine worked. The vaccine turned a disease that once horrified America into a memory. Dr. Jonas Salk, left, and Dr. Julius Youngner shown working in a research lab during the development of the first polio vaccine, which was injectable. Now 84 and a professor emeritus at the University of Pittsburgh, Youngner says Salk offended some of his colleagues by refusing to credit their contributions to the development of the polio vaccine. Fifty years ago, on April 12, 1955, the world heard one of the most eagerly anticipated announcements in medical history: Dr. Jonas Salk's polio vaccine worked. The vaccine turned a disease that once horrified America into a memory. NPR's Joe Palca looks back at the science that created a successful vaccine -- and the people behind the medical milestone. 1800s Paralytic poliomyelitis (polio) takes its toll worldwide, affecting mostly children. The disease is known as infantile paralysis. 1894 The first known polio epidemic in the United States occurs in Vermont. 1908 Dr. Karl Landsteiner discovers that a virus causes polio. 1916 The first major polio epidemic strikes in the United States; 27,000 people suffer paralysis and 6,000 die. Increasing numbers of outbreaks occur each year. 1921 Franklin D. Roosevelt is diagnosed with polio. 1928 Iron lungs are introduced to help patients with acute polio breathe. 1932 Franklin D. Roosevelt is elected President of the United States. 1938 President Roosevelt founds the National Foundation for Infantile Paralysis (NFIP, known today as the March of Dimes). -- At the New York University School of Medicine, Dr. Jonas Salk begins working with virologist and epidemiologist Dr. Thomas Francis Jr. on an influenza vaccine later used by the U.S. military during World War II. 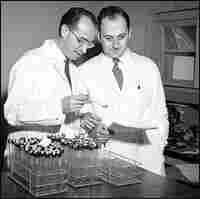 1947 The University of Pittsburgh recruits Dr. Jonas Salk to develop a virus research program. Techniques Salk picked up while working with influenza are later used to develop the polio vaccine. 1948-49 Scientists confirm the existence of three strains of poliovirus. 1949 Dr. John Enders, Dr. Frederick Robbins and Dr. Thomas Weller develop a way to grow poliovirus in tissue culture, a breakthrough that aided in the creation of the polio vaccine. 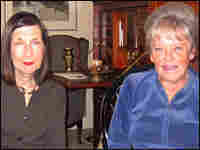 Their work earned the three scientists the Nobel Prize in physiology or medicine in 1954. 1952 The United States reports 57,628 polio cases -- the worst U.S. epidemic on record. -- Dr. Salk and his colleagues develop a potentially safe, injectable vaccine against polio. Nearly 15,000 Pittsburgh-area subjects, mostly children, receive the vaccine in pilot trials. -- Salk's former mentor, Dr. Thomas Francis, designs, directs and evaluates field trials of the polio vaccine. Unprecedented in their scope and size, the trials involve around 1.8 million children from the United States, Canada and Finland. They are among the first to use the double-blind process that has since become standard. 1955 On April 12, Francis announces the results of the field trials, declaring that Salk's vaccine is "safe, effective and potent." 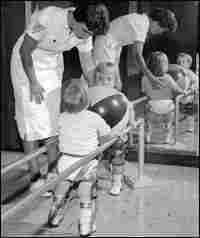 1955-57 Once the vaccine becomes available, U.S. polio cases drop by 85-90 percent. 1961 Dr. Albert Sabin develops an oral polio vaccine. 1963 Congress creates the Immunization Grant Program. Reported U.S. polio cases plummet to just 396. 1979 The last U.S. case of polio caused by wild poliovirus is reported. 1985 Rotary International establishes its PolioPlus program. Rotary has contributed more than $500 million to fight polio worldwide. 1988 Worldwide, polio continues to affect some 350,000 people in 125 countries. In response, the World Health Organization, UNICEF, Rotary International and the U.S. Centers for Disease Control and Prevention launch the Global Polio Eradication Initiative. 1994 The Americas are certified polio-free. 1999 The U.S. Public Health Service recommends that the oral vaccine be discontinued in the United States, and a modified injectable vaccine becomes the preferred vaccine. The oral vaccine -- which is cheaper and easier to administer -- remains the vaccine of choice for eradication efforts elsewhere around the globe. 2000 The Western Pacific region is certified polio-free. 2002 Europe is certified polio-free. 2005 April 12, 2005, marks the 50th anniversary of the Salk vaccine. Global eradication efforts have helped lower worldwide polio cases to just 1,263 reported cases in 2004. Sources: The Global Polio Eradication Initiative; U.S. Centers for Disease Control and Prevention; the University of Michigan; PBS Online. Poliomyelitis (polio) is caused by a virus that enters the body through the mouth. The virus multiplies in the intestine and invades the nervous system. It can cause total paralysis in a matter of hours. One in 200 infections leads to irreversible paralysis. Among those paralyzed, 5-10 percent die when their breathing muscles are immobilized. Polio has no cure, but it can be prevented. Given multiple times, polio vaccine can protect a child for life. Global polio cases have dropped from an estimated 350,000 cases in 1988 to 1,263 reported cases in 2004.